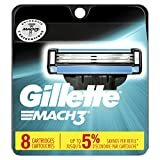 Fan Favorite Gillette Disposable Razor Refill Cartridges 8 ct. Its 3 blades are positioned progressively to extend gradually closer. For every stroke you take, it takes three. And fewer strokes mean less irritation. Blades coated in Patented DLC (Diamond Like Coating) for strong, sharp blades that cut close.